HOW do sailboats move against the wind? 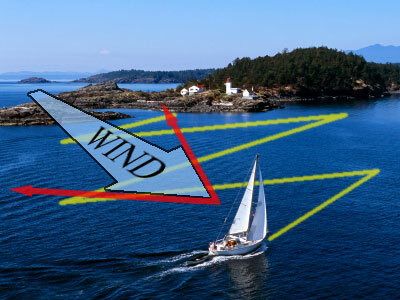 If wind is available, and a boat crewed well - sailboats are able to point and sail in any direction EXCEPT a course pointing within 45° either side of the windline (between the red lines). 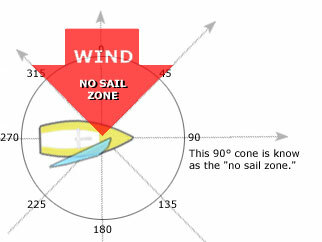 That 90° cone-shaped area is called the "No Sail Zone." In this illustration let's imagine that the crew desires to land on the leeward side (opposite side the wind is blowing from) of the island... They will NOT be able to point the bow into the no sail zone and make headway. The sails would luff (flap like a flag) and the boat would drift backwards (downwind). However(! 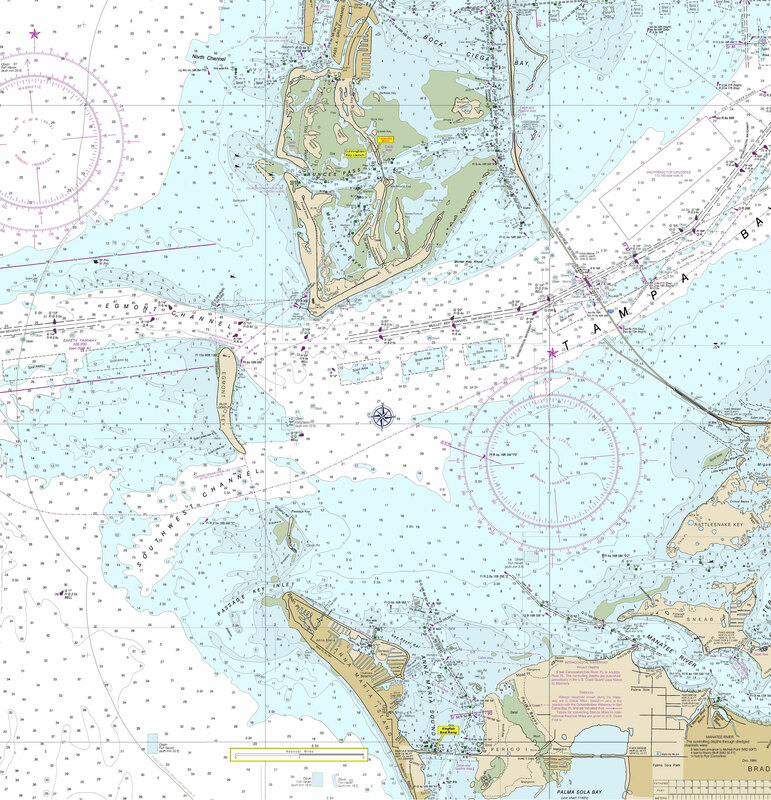 ), they can take alternating courses across the windline and make steady progress towards their desired landing. The yellow lines indicate a possible route to their destination. That route would require four turns (called "tacks") across the windline. What do we need to bring to the sailing lesson? What should one NOT bring to the sailing lesson? Tanning oil - the slippery stuff(! 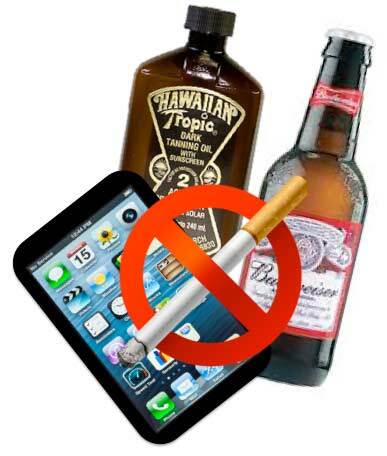 ), cell phone, MP3 player or cameras (leave them in your car please), tobacco products (smokeless included), alcoholic beverages. We can go for a beer or margarita afterwards but I want focused learners on board. Learning and alcohol do not mix well - and just a little booze can result in a sailor making dramatically poor (and costly!) decisions. Where do we meet to launch? This will be discussed in our orientation meeting. 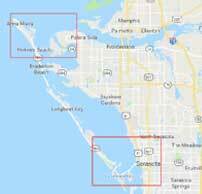 First lessons usually meet at a boat ramp where the expected wind direction will make launching and landing as easy as possible on the day of the sail. We will rig (PDF | Slideshow) and load Joycee in the parking lot, and launch her via the ramp. The selected ramp will be identified by phone a couple of hours prior to the sail. Absolutely! 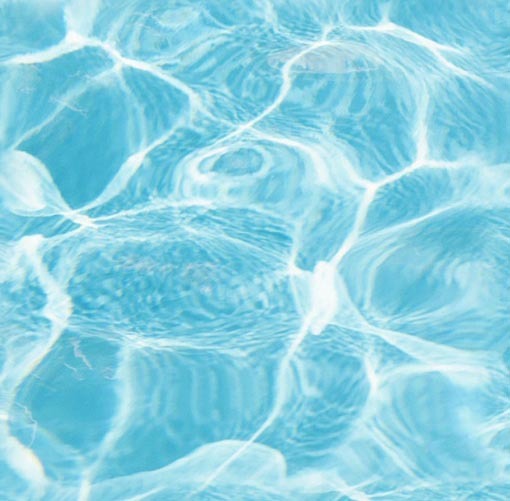 You should be able to tread water for 10-15 minutes - OR at least be comfortable in the water in a PFD (personal flotation device) for that long. We will have PFDs on board as required by US Coast Guard regulations - and we will wear them if conditions warrant it. 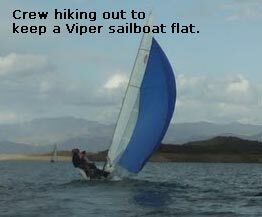 A daysailer of this size (17' in length and only 460 pounds when empty) can be capsized during poorly executed gybes (a downwind turn): Videos! Great gybe | Poor gybe & capsize (BRRRRR... dirty trick!) - so sailors must be comfortable with the posibility of getting wet... and having to swim briefly. If an accidental capsize does occur DO NOT delay in securing a handhold on the boat. The currents are typically pretty gentle in our sailing waters - but in some areas (narrow channels) and in windy conditions it is possible to be swept downstream by the current. As you can imagine, this could be a serious problem! When we practice intentional capsizes we will do so in shallow and still waters. CAPSIZE!!!! Huh - What is that!? A capsize is not as scary as it sounds - unless you are out in very bad weather. We can practice this capsize & recovery drill in shallow water until it is second nature and can be performed fairly rapidly. Most students can recover in less than 90 seconds after a half dozen attempts. After you master it - it is fun. Yes - Really(!) - often a favorite memory of your lesson. Won't I be lost because of all the "SailorBabble" language being spoken? No, nooo Matey! 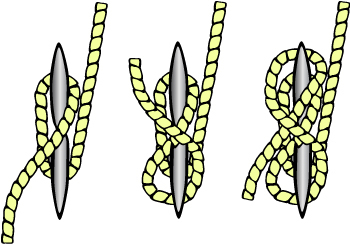 BUT - by the end of the lesson you will know a sheet (rope) from a sail, a halyard from a vang, port from starboard, keel from rudder, hauling versus easing, centerline versus windline, tacking versus gybing, and a lot more besides. We will learn and practice this particular lingo as we sail. Want a headstart? See the Parts Listing Illustration for a Hunter 170 or if you want to test your current knowledge practice identifying the parts of the Hunter 170. Is there a book you would recommend to prepare for this sailing lesson? YES! One of the best books written on sailing is by the couple JJ (US Olympic sailor) and Peter (America's Cup sailor) Isler. It is very complete, covering just about every kind of sailing; daysailing, cruising, racing, windsurfing and more. The book is one of the "__X__ for Dummies" volumes, but don't be fooled. Only dummies don't buy and read this book. It's funny, full of great illustrations - and a it's a book you just can't put down. The title is of course - Sailing for Dummies. It's about $15 on Amazon.com. Another AWESOME sailing book you will treasure is First You Have to Row a Little Boat; Reflections on Life and Living by Richard Bode. My experiences with sailing are similar to Richard's. There are hundreds of important life lessons that are vividly evident when learning to sail. Do you need to be strong/fit to sail? In a small sailboat you'll need to be able to pull yourself back into the boat after a capsize - and you'll need to be able to lean outward (called hiking out [video]) over the side of the boat as it heels (leans) over in strong breezes. This takes some abdominal and hip flexor strength. If you can do 20 situps... and 10 pushups you should be just fine. 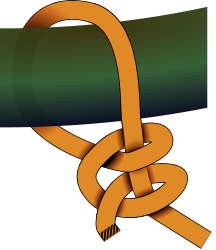 Don't you have to be an eagle scout with badges in knot tying to be a sailor? 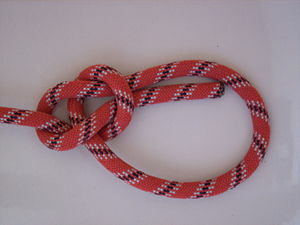 3. two half-hitches [round turn + same]: two consecutive overhand knots tied around a post or similar - a tug on the line just tightens the knot. 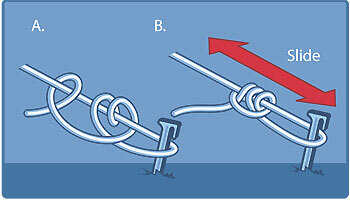 4. a tautline hitch is an adjustable loop tied in a line that is under tension. 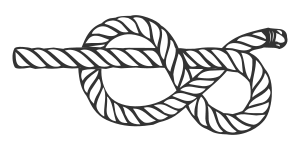 5. a deck/dock cleat hitch: used to secure a boat to a deck/dock cleat or for tying off a halyard on a mast cleat. Ha! No, Joycee is a true daysailer... no "head" aboard. There are bathrooms at the launch site(s). Will we go out regardless of the weather? Oh no! We won't mess with Mother Nature! We will have a target date and time (possibly a range) for launch but if the forecast is poor (lightning, thunder, excessive or erratic winds) or "iffy" we'll stay home. 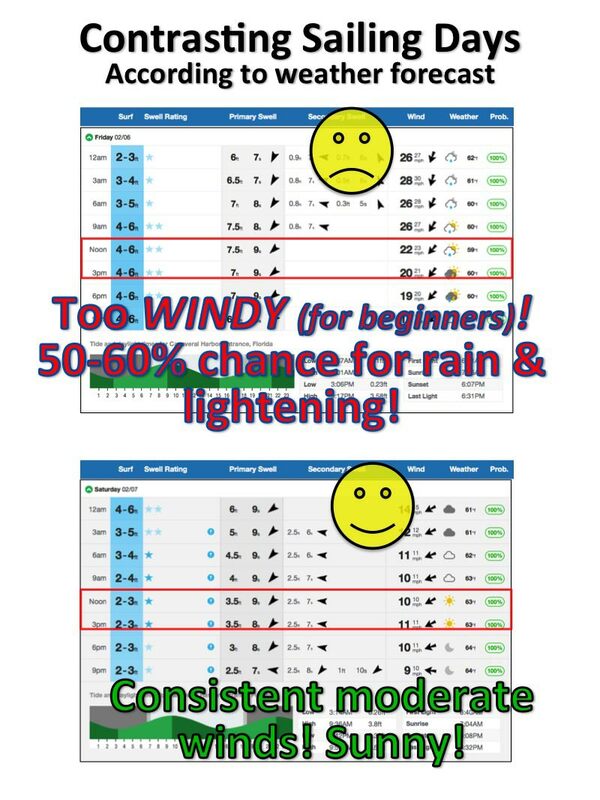 I favor days that are sunny or partly cloudy, steady and directionally consistent winds 5-15 MPH and flat water for beginner classes. 10 MPH winds are ideal for beginners. Here is a contrast of good and poor weather windows for a half-day sail. As they say - what a difference a day makes. IF we see a surprise squall approaching we will beach Joycee and take shelter until it clears. Can my child/dog come sailing with me? We can talk about the child. Sailing can sometimes be a bit scary (a capsize can be downright traumatic for a young child!) - and other times boring to children. Are they interested in learning to sail? Will they remain attentive for the duration of the sail? On the pet question.... Sorry - but no. 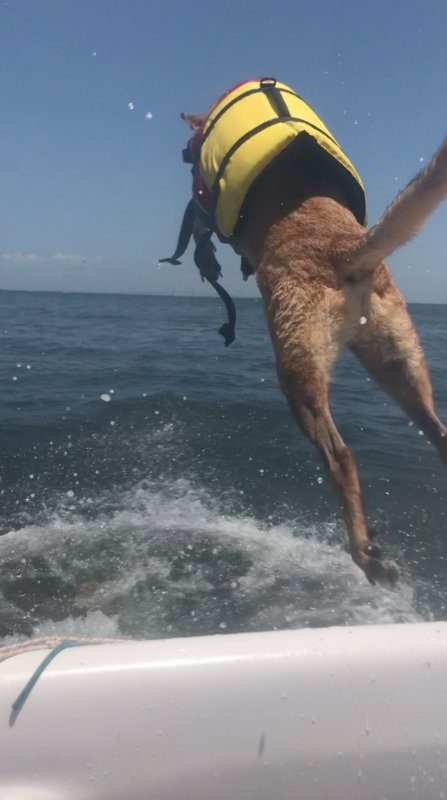 I love animals and often take my dog "Carter" aboard (NOT during a lesson) - He occasionally jumps ship) when nature calls... OR if he sees a dolphin nearby!) - FUN but a serious distraction we must avoid. They get overheated too. It's just not a good idea. It happens... Not a problem. We will try to reschedule. Please call me ASAP via my cell at: 912.481.0718.